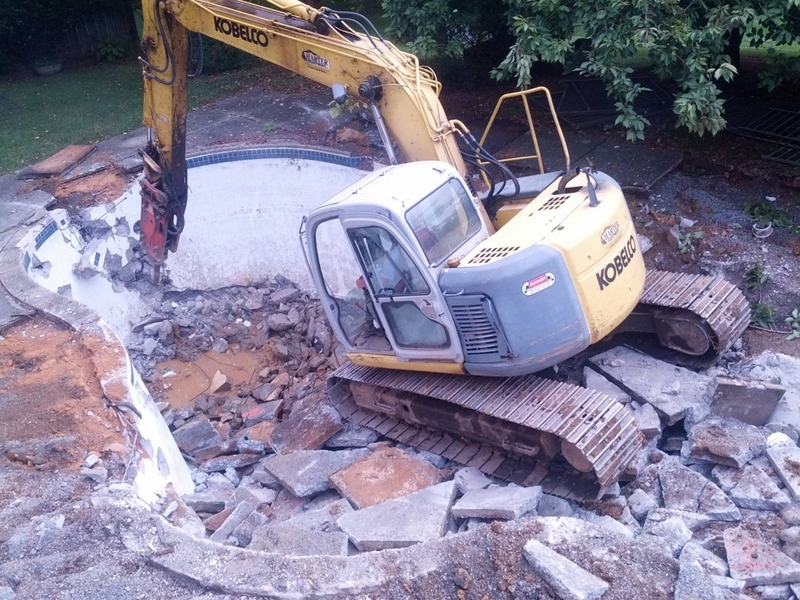 This is the story of the removal of our 40-year-old in-ground cement swimming pool. We aren’t pool people, but the house came with a pool and we loved the house, so we dealt with the yearly maintenance hassles until the pool started to leak in the summer of 2013. I tried to find and patch the leak, without success, spending more time in the pool that summer trying to fix it than I had in the previous 10 years. We also wanted to renovate our backyard into something more usable for us, and while we originally planned to keep the pool just because removal seemed like such a massive project, once it began to leak and we were faced with large costs to fix and renovate it, the choice was made for us. I did some online research, and learned that the cost to remove a pool ranged from about $7500 to maybe $15,000-$20,000, depending on the size and work needed. 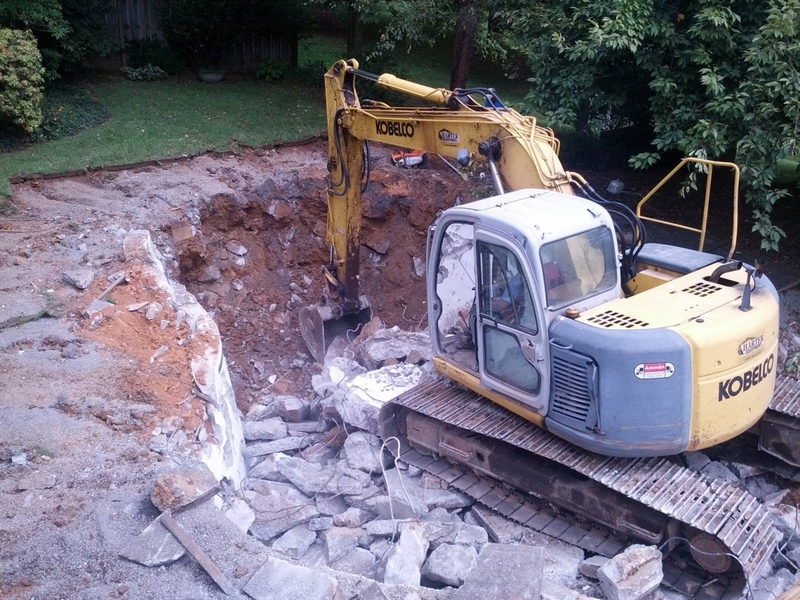 The low-end seemed to be for demolition without removal – where the bottom is broken up, and the sides of the pool are knocked down 3 feet or so and the cement is piled into the pool area, and the remainder filled with dirt and covered with topsoil. But I didn’t really want this, since this can be a liability when you sell the house as you have to disclose to the buyer the presence of the pool debris so he knows he’s in for a real hassle should he want to build on that spot or install another pool. The other method is to remove all of the concrete, but this is of course a bigger project and generally significantly more expensive. I knew I wanted complete removal, and depending on the zoning in a particular area, complete removal might be required anyway. 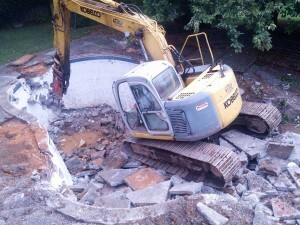 I then did a web search for pool demolition or removal companies. I found one company that looked good, and I called, but they were located too far away and didn’t service our area. But they suggested a company called Atlantic Equipment Corp as a competitor that they knew of that was closer to us. Thanks for that!! I called Atlantic in mid April, and the proprietor Allen came out that week to check out the job. I was nervous given that it seemed like such an insurmountable task, but he was very easy-going and non-plussed about it – he’d clearly done this before. He knew exactly what to look at, measured for all the concrete that needed to be removed from the pool and surrounding patio, and got back within about a week with a quote. I almost fell over when I read it: the bid was $8800, for complete removal of all the concrete in the pool and surrounding patio! I immediately sent back an acceptance. The only (minor) down-side was that at that point they were already scheduled through the summer, and couldn’t get to us until after labor day. So if you’re thinking of having a pool removed, try to sync with the contractor in the winter so you can get to the front of the line. When the team came out in September, I was surprised to see only 3 guys: Al, a well-seasoned hand who was the backhoe operator, Pablo, the general laborer, and the dump truck driver whose name I forget. Turns out these guys were more than enough for the job! I was initially concerned about a few things – the pool was in our back yard, and down a steep incline from the end of our driveway, so I wasn’t sure how they would get to the pool or remove all the concrete and dump the dirt; and we had finally, after several years of asking, just gotten our cable company to install a new cable run to our house, and it ran right under the yard between the driveway and the pool; and our deck was right along the edge of the path to the pool, so we were nervous about having heavy machinery breaking up concrete right beside it. I mentioned this to the guys, and they took it all in stride: they used a load of dirt to build a ramp from the driveway to the pool, they painted a line over the cable run and Al made sure to not turn the backhoe over that area so the crawler treads wouldn’t tear up the cable, and Al ran the backhoe with such skill that I quickly stopped worrying about the deck. True pros! They began by removing the fence surrounding the pool area, jackhammering the pool surface to pieces, and pushing the patio slabs into the hole. Al then used the backhoe shovel to lift the pieces of the pool maybe 20 feet into the air and drop them so they’d break up into manageable chunks. 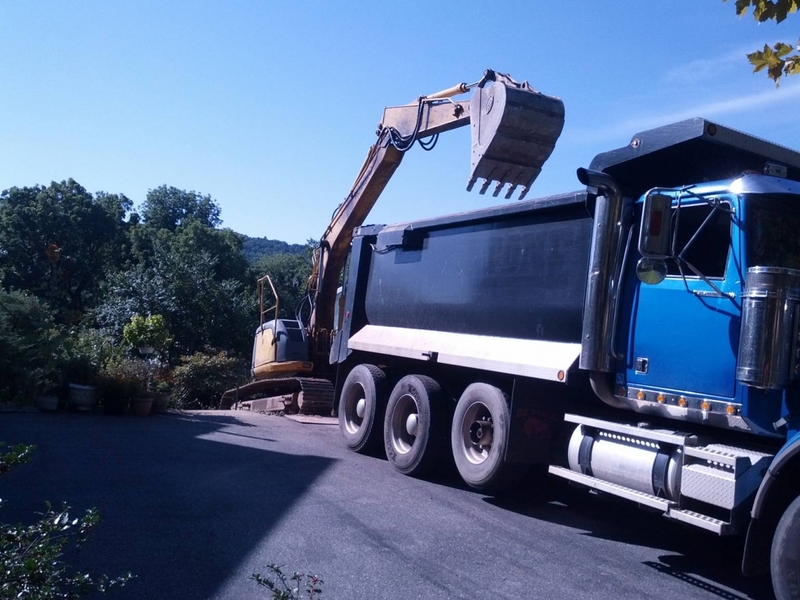 Since they couldn’t get the dump truck down the ramp, Al then drove the backhoe back and forth between the pool and the driveway, up the ramp, to drop each shovelful of concrete into the dump truck. This took many, many trips – I don’t recall how many full truckloads of concrete there were, but there were lots! But Al was careful on each trip not to turn the backhoe on the line where the cable was, and the cable survived the whole affair unscathed. They removed all the debris – cement, rebar, pool equipment, fence; the removal took about 2 or 3 days, at which point we had a giant dirt hole where our pool had been. They then trucked in load after load of clean fill, dumping each load on the dirt ramp; Al then drove back and forth with shovelfuls of dirt to fill in the pool, packing it down with both the shovel head and driving over with the crawler treads. The filling took a couple of days, after which they used a smaller bobcat to spread about 4″ of topsoil. 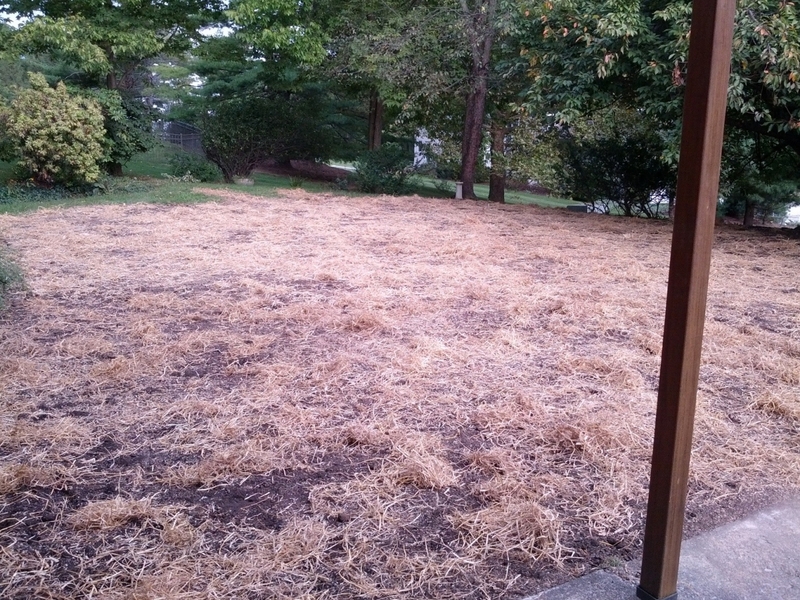 They then grass-seeded and strawed the area, including the area where the backhoe had driven over the lawn and the dirt ramp to the driveway. 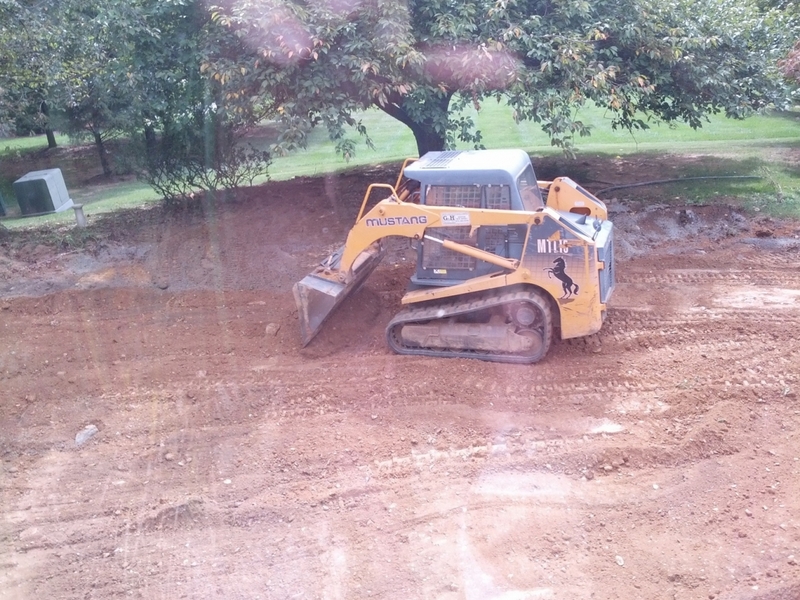 The only mishap came when the backhoe blew a hydraulic line, which took about a half day to fix. There were also a few days when the crew wasn’t working, either due to rain or obligations elsewhere, so even though the work was about 4-5 days total it stretched over a couple of weeks. But Allen had said when doing the initial assessment that they preferred to do it that way, to get a chance to get some rain on the dirt so it would help with settling. And when they had to decamp at one point for a couple of days to work on another job, Allen apologized for the inconvenience and offered to pay the permit costs for the job. I couldn’t be happier with the result. We now have a back yard where we previously had an unsightly and troublesome pool. The grass has grown in wonderfully (watered religiously), and we’re now discussing what we want to do next – patio, deck addition, gardens… (I joked with my wife that it now looks like the perfect place for a pool.) My only regret is that I didn’t do this 13 years ago when we first moved in. 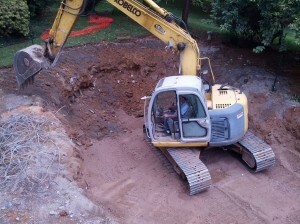 And if I ever have to remove another pool (which I hope I don’t), I wouldn’t hesitate to call Atlantic again. Real professionals and good people.